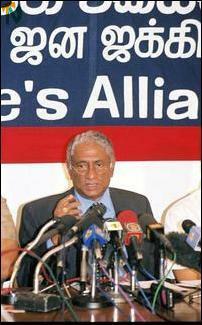 Mr. Lakshman Kadirgamar, advisor to President Chandrika Kumaratunga’s and Sri Lanka’s former foreign minister, slammed the Liberation Tigers’ proposal for an Interim Self Governing Authority at a press conference in Colombo Wednesday to explain his party’s reaction to the LTTE’s suggestions. “We can in no way consider the LTTE’s proposal. It is totally unacceptable that they (Tigers) would have access rights to 2/3 of Sri Lanka’s coast. This is not negotiable”, the President’s confidante charged. In their proposal for an ISGA for the northeast, the Liberation Tigers suggested the authority be given sole access rights to the adjacent seas. Mr. Kadirgamar categorically denied that the sacking of three key ministers of Prime Minister Ranil Wickremesinghe’s government Tuesday and the proroguing of Parliament had anything to do with the LTTE’s proposal for setting up an Interim Self Governing Authority (ISGA) in the northeast. 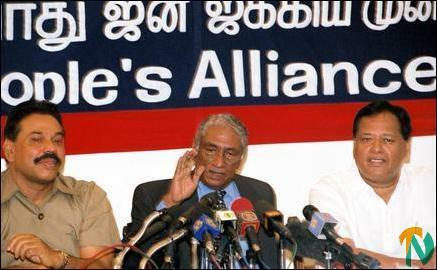 He lambasted the LTTE’s proposal as a “total incursion into Sri Lanka’s sovereignty” and hence unacceptable. Mr. Kadirgamar said that the move was made in accordance with the President’s long-standing position that the Prime Minister Ranil Wicremesinghe’s government was endangering the country’s security. President Kumaratunga’s opponents charge that she moved at this juncture to stop Prime Minister Ranil Wickremesinghe from restarting peace talks with the LTTE on the basis of the ISGA proposal, which, according to them, would have encouraged countries that had pledged a vast sum in aid at Tokyo donor conference earlier this year to release funds for development in Sri Lanka. They say that President Kumaratunga moved as she did to to throw the spanner in the works, to scuttle ‘positive negotiations’ on the ISGA that would have spurred the economy further, boosting the popularity of Prime Minister Ranil Wickremesinghe’s government. 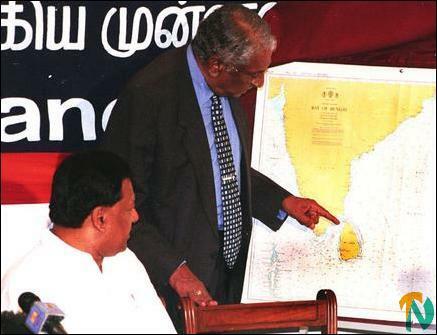 Sri Lanka's former foreign minister and President Chandrika Kumaratunga's advisor, Mr. Lakshman Kadirgamar, shows the Sri Lanakan map and explains to journalists the security of Northeast coast Wednesday at the Opposition leader's office in Colombo. Mr. Lakshman Kadirgamar addressing the press conference(center). Opposition leader Mahinda Rajapaksa(left) and Sarath Amunugama (Right) are also seen.